The Nōbi Plain, stretching from the Mino area of southwest Gifu Prefecture to the Owari area of northwest Aichi Prefecture, has been a home to a wide range of manufacturing industries, including Toyota Motor Corporation, locating its headquarters and factories. 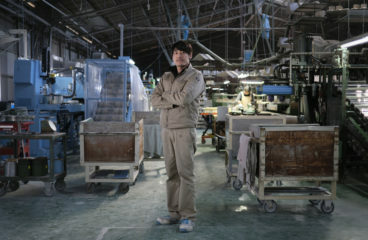 And Higashi Mino area in Gifu has been a production center for ceramics since the 16th century. Maruasa Porcelain Factory is a traditional manufacturer, creating ceramics for over 100 years in Higashi Mino region. 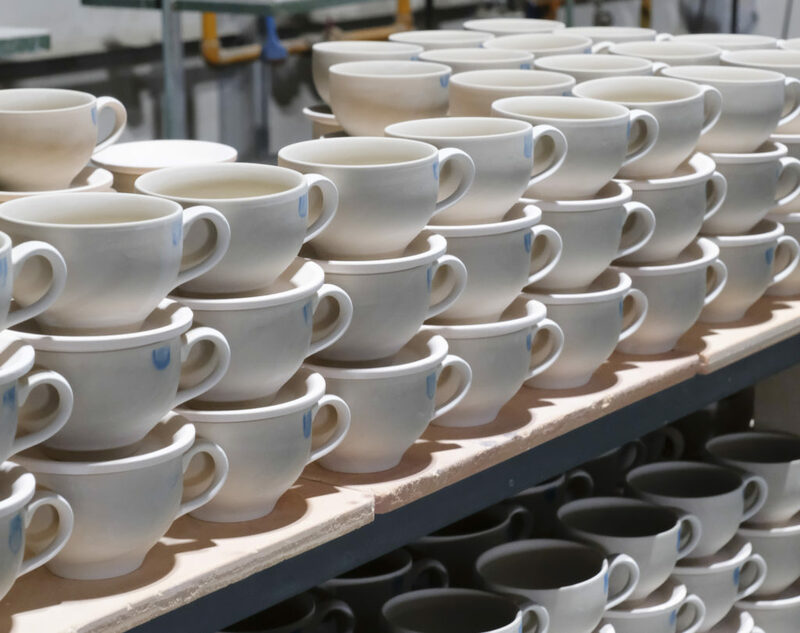 OEM products are manufactured for major tableware companies in Japan, along with the United States and Asia, delivering more than 250 million ceramic products worldwide. Maruasa specializes in manufacturing cups and saucers. It’s no exaggeration to say that every Japanese has drunk coffee out of a cup Maruasa created at least once in their lifetime. It’s not surprising because coffee cups sold in leading tableware companies, cups used in franchised coffee stores, and printed cups sold at world-famous amusement parks are all created by Maruasa. And not only that, Maruasa has been producing OEM products for major tableware firms and kitchenware brands in the United States for over 50 years. 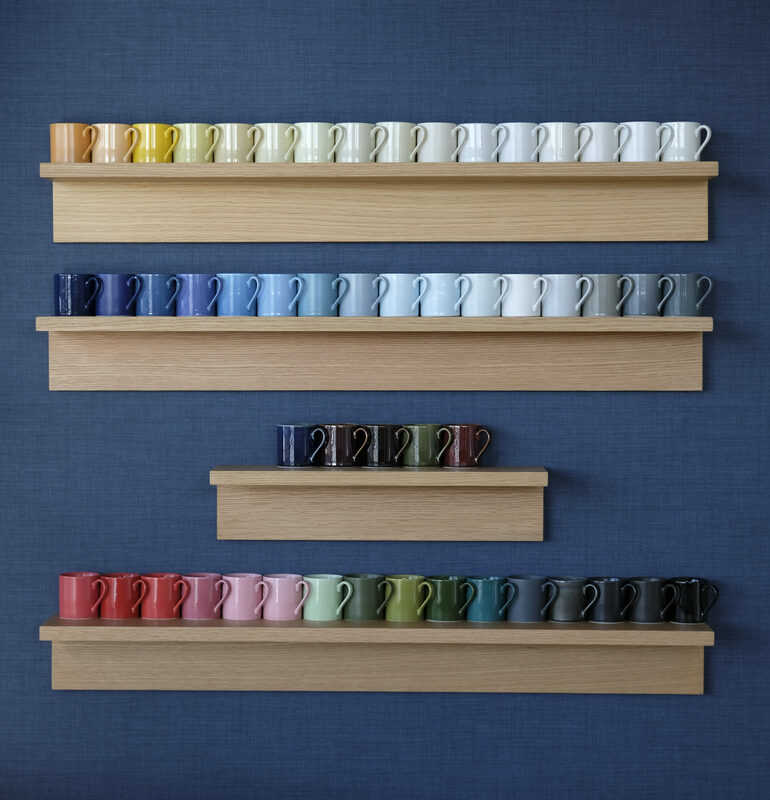 Maruasa has delivered cups and saucers across the world for more than 100 years. How did Maruasa earn their customers’ trust? Secret lies in the endurance of their ceramics. Porcelains are usually fired in kilns heated up to 1,270 degrees. Firing it up at this temperature meets the industrial standards for endurance, heat-resistance, and quench test within Japan and other nations. Maruasa, however, insists on firing it at 1,300 degrees. It might be only 30 degrees, but this 30 degrees makes a big difference to the porcelain. Moreover, by applying a method called reduction firing, the oxygen in the kiln is removed, allowing the purity and density of the clay to increase. After slowly firing the porcelain for 22 hours, it has a very high endurance level. Reduction firing can create a highly durable product without water absorbency. Unglazed, the surface of the ceramics is fine and smooth. There’s more to Maruasa’s cup. Normally, cups are 4mm thick but Maruasa produces it in 1.5mm thick while keeping it highly durable. Manufacturing it thinner allows Maruasa to produce it on a large scale. 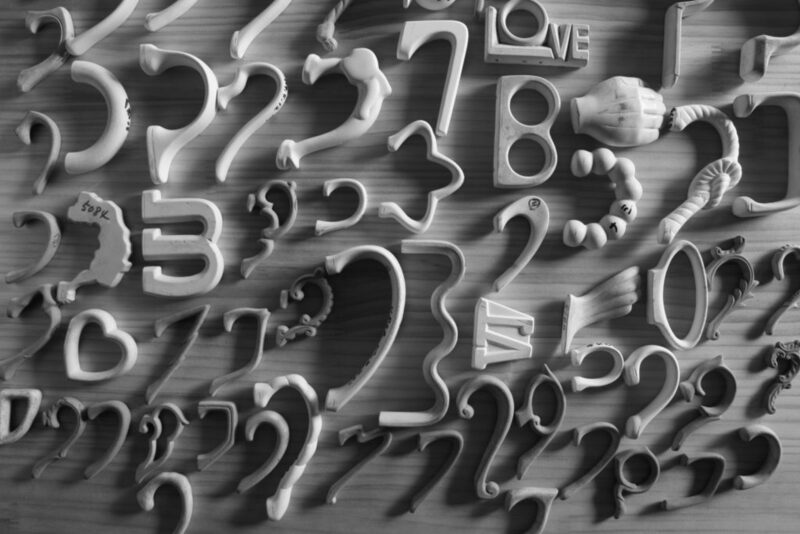 When the ceramic is thinned, molding becomes difficult. 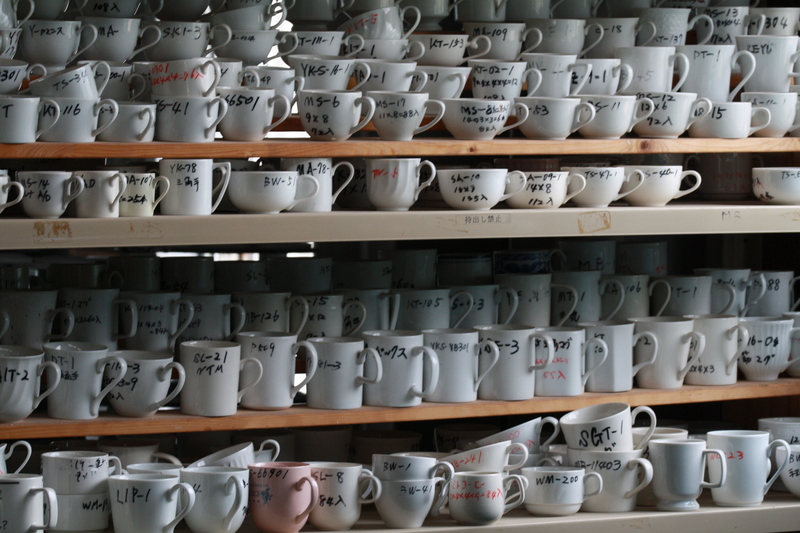 It may be possible for an artisan to carefully produce cups one by one. However, Maruasa Porcelain Factory, being a major OEM, produces the same cup by the thousands. Quality control for mass production, including machine setting, accuracy of the mold, and quality of the clay, is difficult. But Maruasa earned its trust from the international market by consistently providing stable high-quality products. Maruasa is strong in the strengthened porcelain, clay consists of 20 to 30% alumina. Maruasa has delivered more than a million products, with high break resistance, to leading kitchenware manufacturers in the United States. Maruasa’s known for its Japanese-like designs, which differentiates them from the rest. With more than 300 cup designs and 1,000 saucer designs, Maruasa could meet all customers’ needs. It also has fine ceramic staining skills. In general, ceramic stains become pale when the temperature rises. But, with the appropriate blending of the glaze, even under 1,300 degrees the company can secure the color the customer requested and provide an abundant number of samples. 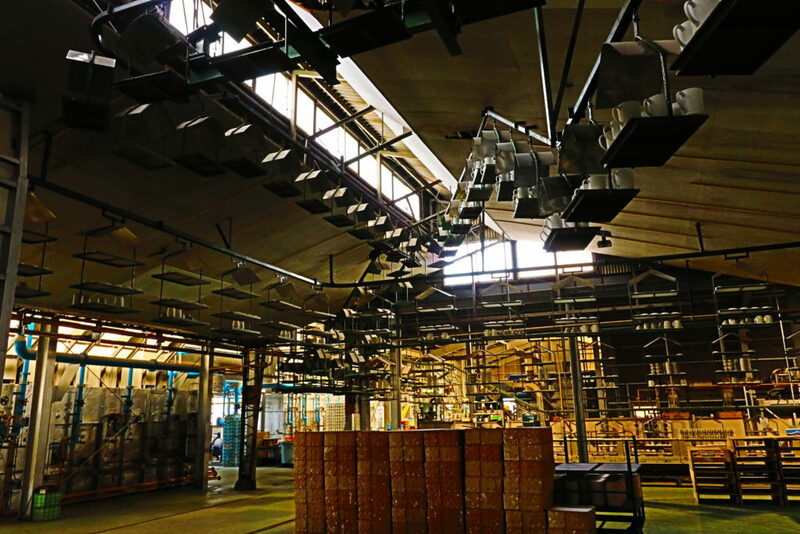 You will witness something unique at Maruasa’s main factory. A work platform called Free Curve transports the cups in the air while drying. In each booth, skilled artisans work with their hands and the machine. The kneaded clay will be divided into pieces by the operator and then molded by the high-speed potter’s wheel. After the cups are dried and their handles are attached by hand, they will be burned unglazed in a long kiln called the tunnel kiln. When the heat from the firing is quenched, the glaze will be applied to the cup. The inner cup will be covered with a ceramic fiber that is used in the aerospace industry. Finally, the cups will be baked in the fiber shuttle kiln, which has very high insulation that is effective for 22 hours. If a brand name or illustration is to be added to the cup, staff will place a silkscreen ceramic decal on it and bake it again at 800 degrees. Maruasa’s products meet quality standards of various countries. They’ve cleared Proposition 65, a leaching standard of California. Maruasa is not just committed to OEM products; they recently started to focus on developing house-brand products. 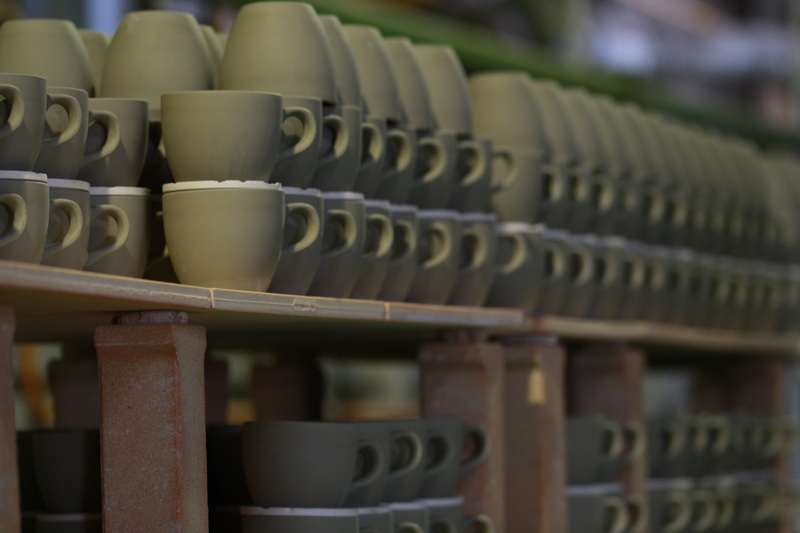 Collaborating with a brand in New Zealand, they’ve created a pastel-colored eggshell porcelain cup. Enjoy a cup of coffee with one of Maruasa’s cups. The more you use it, the more you will appreciate the fine history of the Japanese pottery manufacturing industry. Maruasa Porcelain Factory Co., Ltd.
Company Name: Maruasa Porcelain Factory Co., Ltd.